When we think of garden design we tend to think of layouts for lawns paths and garden beds. This is indeed an integral part, however for many gardeners the actual plants, where and how they are integrated into the garden layout are one of the most important elements if a garden designer or landscaper is to be seen as creating a successful and aesthetically pleasing garden. Although garden design may seem like an architectural design project it is really an ongoing process. Gardens grow, they are not static, plants get bigger and change the immediate microclimate. All plants have a relationship with those around them, they help each other and sometimes compete. Shade and moisture, humidity and soil nutrients are all a relationship thing with plants. Plants die and again those other plants that rely on it will react, they may relish new conditions, or find them unsuitable. When plants die we can replant the same type, or look for reasons and plant something different. We can replenish the soil improve light and ensure proper drainage, all tasks for the constant gardener. Yes we do design and build gardens, however a garden is never finished, the work is ongoing as is the enjoyment. All gardeners can look at the basic principles of aspect, soil, light, plant height, colour and texture and after some consideration create a successful plan for a garden or broader landscape. 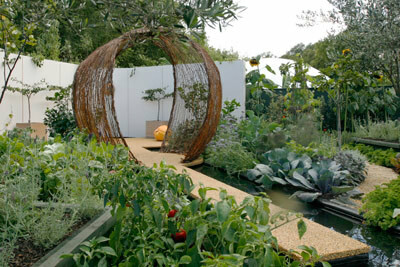 If you could write a book 'The ABC of Garden Design' then inspiration and ideas might be easier to put into a plan. 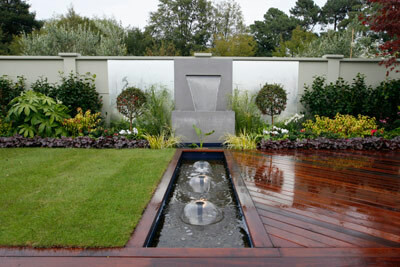 However one of the main aspects of garden design is deciding who to design for. You will draw up a different plan if you are designing with resale in mind to what you will if you are designing totally for your own tastes. So first of all decide who you are designing the garden for. If only it were that easy, 3 easy steps to creating the perfect garden design, and preferably for free. Sorry it is not that easy, however it is not that hard either, we can show you a few basic steps to designing a garden to fill your needs and meet you budget. Designs like those pictured right, take time and consideration. The first step is to list the features you would like in your garden, are you looking at a productive vegetable garden as a main focus, or is it an easy care outdoor living area. Are you looking at a small courtyard or a larger country garden? So the first step for many is to m ake a list of what we want in a garden, however for others looking at what garden designers have already achieved and choosing a basic idea to adapt to their own garden is the first step. If you have the confidence to make your own list and then plan your garden, that is the way to go. If you need a little inspiration, we can help, photographs of a range of ideas on garden designs, pathways, fountains pots, outdoor living areas, ponds, fences, seats and planters. 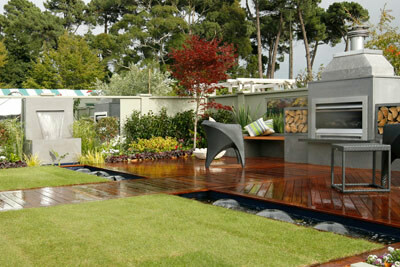 Good Design needs consideration and an expert eye if you are to make the most of any garden or outdoor area. Landscape design including Roof Garden Design, when properly executed can add value to a property as well as enhancing the aesthetic appeal and usability of outdoor areas. Qualified landscape designers will work with you to help you make the most of your project. Landscape edging and landscape lighting are only two of many elements. Garden design ideas and landscaping idea photos provided on this page are from both private gardens and display gardens from around the world. The inspiration provided by these garden design photographs is free, however a planned garden may take a lot of thought, consider using a trained garden designer, in the long run it will probably save you time and money. When it comes to gathering ideas for gardens and general landscaping projects it is easy to be seduced by the glossy magazines, however gardening shows allow you to get 'close up' and perhaps even meet the designer. You may be able to ask a few questions. We all know about the show gardens ay Chelsea, but what about the Ellerslie Flower Show in New Zealand. Its a long way to go, however if you do happen to be visiting, check it out. 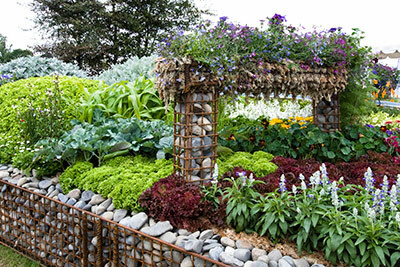 Flower bed designs can also be innovative, a Gabion type wall with arches in a similar design. The flower bed is raised (provides excellent drainage). Plantings are mixed, and the raised bed allows easy access. Lifting plantings closer to eye level is a trick that has been used for centuries, often overlooked but worth considering in the right garden. We are often asked about free garden design software and the best we can come up with is the excellent 'Sketchup' from google. Its not specifically designed for gardens however it can be beefed up a little with the addition of the plugin SU Podium Browser. Sketchup is available as a free download for both Windows and Mac (10.5+). SU Podium Browser has 2 versions, a free one and an advanced paid version. A range of plants including Agaves, Bamboo, Trees and Palm trees are all available.